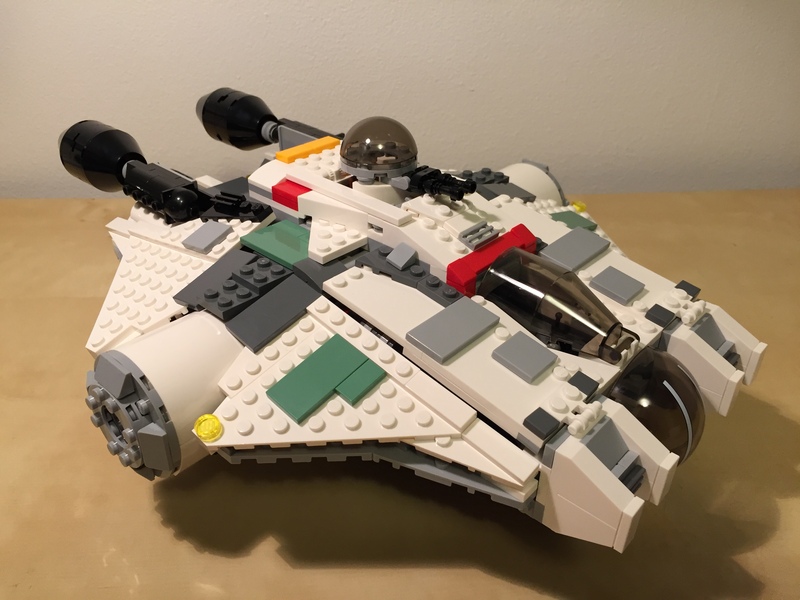 I recently purchased the LEGO Star Wars Rebels 75053 The Ghost set to cannibalize for a MOC project. However, before I parted out the set and sold off the minifigures, I built the set one time and purposefully spread the build time across several days even though the set itself should only take a couple of hours of concentrated build time to complete. Why? A personal reason stems from the enjoyment and stress relief that comes from building something with my hands. I see the model take shape as I place brick after brick. I take joy in the innovative techniques employed by the model’s designers. I reflect on the relationship of the model to its source material–in this case, the television program Star Wars: Rebels. From a learning perspective, the haptic experience of building the model by following its instructions teaches the builder the process and techniques of the designer. Combined with the builder’s experience gained from model building and creative expression, one can reflect on the model’s design and guess about alternative methods and potential roadblocks encountered by the designer in earlier versions. In a sense, LEGO bricks serve as an interface between builder and designer, and through the interface, the builder learns and imagines new possibilities, which the builder can turn toward future projects. Building, pulling apart, rebuilding, redesigning, and creating forms the basis of a self-perpetuating active learning experience–one that begins guided and ends self-directed. By spreading the build across several days, it allowed me to enjoy an extended building experience while giving my brain the space to think about and reflect on the building techniques employed by the sets designers. Had I built the model as quickly as I could have otherwise, I would not necessarily learn as much from the instructions and haptic experience of following the instructions to construct the model. Based on my extensive first-hand experience as a LEGO builder and an educator who uses LEGO in his Technical Writing and Science Fiction classes, the transition from guided to self-directed learning is one of the powerful characteristics of LEGO as a learning platform. Furthermore, its orientation as a technology of play opens engagement and enables learning that is fulfilling because of the enjoyment that it can bring about (of course, LEGO might not be for everyone and the source of enjoyment in learning differs from person to person–as with the projection learning with lecture and PowerPoint, or other forms of active learning exercises, I propose that LEGO is another tool in the educator’s toolbox that can be used, repurposed, hacked, etc. as the case and need arises). Before I disassemble The Ghost, here are some images of a nice model that accurately captures its source while adding play elements that fans of the series–young and old–will likely enjoy. If you’ve deployed LEGO in some way in your classroom or assignments, share your thoughts and experiences in the comments below or ping me on Twitter.